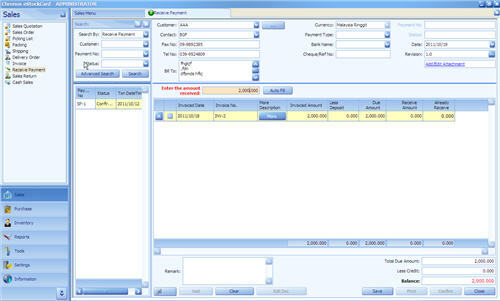 After the sales invoice has been generated, we shall proceed to expedite customer’s payment. Step 2 System will automatically list down all the outstanding invoices that belong to this customer, you can opt to pay a single invoice or consolidate several invoices in a single Receive Payment by ticking the small check box. Step 3 You can enter partial or full payment that received from customer. 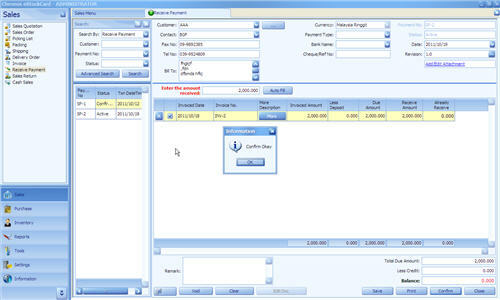 For example, the total due amount (outstanding amount) for the customer is 2000.00 (Invoiced Amount – Already Receive). If you have more bills to be paid in a single Receive Payment, you can enter the value to the “Enter the amount received” and follow by clicking “Auto Fill”, system will automatically fill up each line (from first line and subsequently proceed to the next). Otherwise, you can enter local Receive Amount line by line. Step 5 Click “Save” button, system will assign a unique Payment number and the status will changed to “Active”. You still can amend it as long as the status of the Bill is “Active”. Please repeat the previous steps (from Step1 ~ Step6) and you must be noted that system will generate new Payment number for this outstanding amount settlement for better monitoring purpose.